Showing results for tags 'G40'. As the title says ran these in my car, these are made for Side Mounted bucket seats but could probably be used for base mounted ones too. Work exactly the same way as original seats mount and served me for long enough, Only reason I am selling as I have welded the mounts in. Hi all, Came out the other day to give the G a blast after a couple of days standing and it's completely dead. Dashboard lights/radio/headlights all come on but no turn over. Not even a solenoid click I can also hear an electrical motor sound toward the rear which i presume is the fuel pump. I don't think it's the battery as all the electrics work and i've tried jumping it with a battery pack. Anyone got a clue what might be up? My mechanic skills are a work in progress so it's all a learning curve! Has anyone ever seen a polo genesis g40 interior for sale in the UK before just generally wondering how hard they are to get hold of and how much they sell for. Fault code 07683 control limit surpassed has shown up on my vcds has anyone got any idea what this fault is please? I’ve had my g rebuilt and sadly it came back running like a sack of spuds.i recently discovered the car came back with the timing was a tooth and a half out.so I’ve had ago at putting it right myself as I’ve done it numerous times but as soon as I line my marks up and put the belt on and attempt to tighten the water pump the crank pulley mark moves.does anyone have an explanation as to what could be the problem and how I rectify it please. Help me find this car! 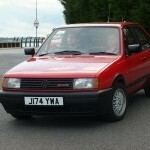 I'm looking for a sorn, white polo G40 with reg J987 TPY. I want to find it for an inspirational teacher who owned this car for many years and then regrettably sold it and has regretted it ever since. Any help appreciated! Thank you. Fully rebuilt my engine and I’ve noticed I have a misfire on cylinder number 3.injector 3 is blocked so I’ve ordered a replacement and hoping that solves the problem.if it doesn’t what else could be an issue? Hey guys n gals. have a few things to ask about the engine bay of ny g40. Ive found several disconnected cables. And some pipes etc that dont go anywhere. Unfortunately im on my iphone and cant upload all the pics so ill put them in some replies. the first one is this. Four connections. Nothing doesnt work. So cant work out where it goes or used to. Its near the header tank. Hey guys n gals, had this shock absorber taken off of my g40. It has the same at all four corners. The reason it was removed is because the cap that holds it in was missing. The original cap (pictured) does not fit, this means i had to replace with a standard shock. Obviously this isnt ideal and i would like to put the large shock back in. I know it is blistein in make. And i think it is ‘b6’ variant. But i am unable to track down a cap for one. Blistein arnt returning my emails despite asking me for part numbers etc. Can anyone help? Hi guys. Recently bought a g40. It came fitted with a performance subframe of unknown brand. Since then i have discovered that the wheels scrub on the arms that replace the antiroll bar. This has led to them undoing. This happened while driving at speed. The arm came away and has bent. while i could have new ones made (fairly sure i cant buy them) however i feel that the car could just be returned to standard as in the long run this would be safer. Meaning i need a g40 antiroll bar. my question, are they the same as a standard 2f bar? I intend to polybush the car etc with a standard anti roll bar as i see this will give me the safest handling. picutures are of the bent arm on and off the car. audioholic his turbo polo "fox"
I'm having a major issue lately... i took the G in to have a shrink fast road cam, lightened followers and vernier pulley. also a new full stainless system and the psd manifold. before the work the boost was kicking out 0.8bar. they didn't remove the charger or the braided oil return pipe but took off the flume and silicone hose to the ic. since getting it back, worn it in for the agreed 30miles for the cam followed as the cam isn't brand new and done 500miles, I found under high revs oil has been spat out all over the bay and around the banjo area and I'm only getting 0.4bar of boost... im going to change the washers to the banjo to see if that stops the leak, but I'm clueless on why I've lost so much boost, can anyone help and whether the oil could be from elsewhere although I can't see that it is?? The timing has been set to zero as though it's a standard pulley... could it he that it needs properly tuning on the timing for the shrink cam and vernier pulley, which is why I'm getting lower pressure??? What colour is this G40? Hi all, I need to swap the seats in my G40 as the driver's left side bolster is down to the metal frame. I went through the seat topics and saw the possible solutions... and renewal is almost is out of reach. Shame. Fine Corrado and Mk2 Golf seats are impossible to get over here in Hungary, so decided to go the 6n2-way as there are a couple GTI of sets around the net. My only question is: Is it s direct and correct replacement? I'm 6'3 and in need to adjust a bit when I sit in to have a bit of head room even the seat is in the lowest position. Will the seating height remain the same? Will the seating position remain the same (I mean no offset to the steering wheel or something else that can be disturbing)? Would the rears also fit? Any help is welcome! Cheers! Anyone had this problem (Mk2/Mk2f owners)? My clutch pedal sticks to the floor when fully pressed, after a sec or so it starts to come up and bangs back if my foot is not on it. The clutch doesn't slip, but every red lamp start is pain and concentration. I seem to be a learner. It seems to be working when full cold, but will stick when the engine gets warmer. I will do a full clutch job in a week, but would I need to change something else also? Cheers! Sentimental moment coming, but it's an anniversary I've been wondering if I'd reach. On the 9th March 2000, I went to Bristol to pick up what was to become my first car. A Polo GT Coupe with 107,000 miles on the clock, full of dog hair and covered in tree sap. I still own it. Which means, for the first time, I've come around to two milestones. Firstly, babies born on that day can start driving today. And, secondly - I've not worked it out exactly - it means I've had this car half my life. Car ownership is becoming less common among teenagers these days. It's quite sad. Looking back, it's amazing what a lump of metal can do. It's been shown: Many times. This was the first - BVF back in 2001. I've made great friends, people who've helped me when I've needed it, sorted parts for me, given advice and even helped double the power under my right foot. Thanks Andy... It transported me and my friends all over the country. Brought us home from memorable nights out. Taken us to memorable weekends away. It kept me in touch in the days before WhatsApp or Facebook. When my girlfriend - now my wife - was up at Sheffield Uni, it did a weekly round trip from Cardiff without fault. It kept me mobile. Of course, it's not always been straightforward. It's broken down when I've neglected it or others have cut corners, it's aged and needed restoring. I've taken most of it apart at some point, finding squeaks and rattles, ironing them out, changing the way it drives. I've tracked it. Not a lot, but among those days it's done a few laps of the Nürburgring (and the return journey). It's also spun off the Nürburgring. Which was interesting. It's followed me through A-Levels, through Uni, through house moves, crap temp jobs and into my career as a journalist. It's shared a driveway with all sorts of press cars. 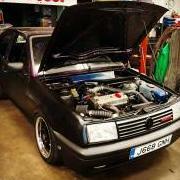 It's been a project car in Max Power and Performance VW - the magazines which, once upon a time, inspired me to waste my money mucking about with silly old cars. It's done many airport runs for press launches. And, when it doesn't, other journalists often ask me: "How's the Polo?" I confess it doesn't do as many miles these days. No ISOFIX. But it's still part of the family. My eldest has his eyes on it already. But best of all, it's still here. Finished for about a year, no new parts to report, just something that puts a smile on my face every time it whines into life. Which it does first time, every time. For all the many new priorities I've picked up in the last 17 years, it's nice to have a constant in there somewhere! Most of you will already know me from the blue 2F breadvan in project threads. This one is a Formel E mk2 which has been converted to a GT. I bought it for a bargain of £500 and ran it over 100 miles already without any issues. The temperature gauge didn't even quite get to half and I was driving quite "enthusiastically". There are issues but small ones. The bad points are rust scabs on rear arches and a bit of rust on an A-pillar which will get sorted. There's a dent in a wing and a few scratches, the dent will come out easy as pie I reckon. Then daft stuff like the exhaust has a small rattle, the bulb has gone in the clocks so I can't see them at night, plus a vibration which sounds like it comes from the passenger seat rail area (probably a missing guide clip). One front wheel bearing may have started to sound a bit rough on the motorway or it could just been in my head! Lol Ahh the name. I didn't choose it...the first owner called it Gloria and put a Gloria sticker on her etc, the name has stuck with all the owners apparently so the name is staying Pictures from the advert for now until tomorrow! I also snapped the folder which contains history Plans now are undecided. It was going to give up its mpi for the 2F but it might stay with the mk2 now as I cook up alternative plans for the blue one.